Family relationships are extremely important in our lives. The in-law relationship is one of them. It is crucial to your child's marriage, so you should treat your son-in-law as good as possible. Show your love on his special day if you really treat him as a member of your family. One way to do that is to share our list of sincere happy birthday son-in-law quotes with him to express your best wishes. You are a perfect gift for our family. You are the member of our family. May the life always show you with gifts. Take your rest on this special day. Truly, you are the son. Mutual love for each other. We receive an amazing gift. The message for your favorite son in law. You bring happiness to our daughters. You are the best choice. You are important to our family. May you have great joys and happiness. You are a perfect match. You are a great blessing to us. You make our daughter happy. You are a great man, son in law. The best way to spend your day. Give your best wishes to your son in law on his special day. 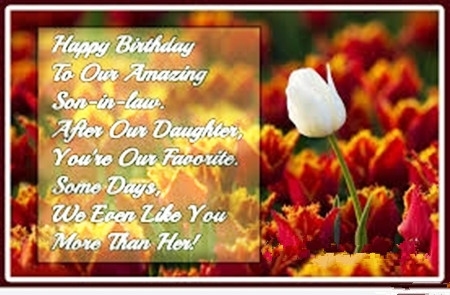 Show your love to your amazing son in law with our list of happy birthday son-in-law quotes. Server responsed at: 04/25/2019 10:05 p.m.